The word bugle in the United States is often used as a generic term for many types of horns including the instruments used by the armed services, drum and bugle corps and by various other organizations such as the Boy Scouts. Nevertheless, bugles have always been specified correctly by the armed services and the suppliers and manufacturers of these instruments as either bugles (a conical bore natural horn) or as a field trumpet (a cylindrical bore natural horn over 2/3rds of its length). 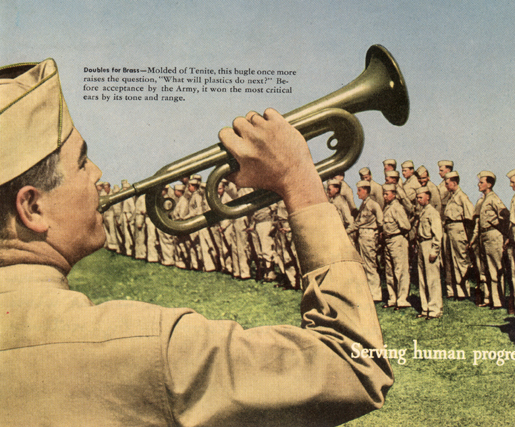 A case in point is the standard so-called U.S. Regulation “G” bugle commonly used by the Boy Scouts and by drum and bugle corps before the introduction of valves or other key changing devices. 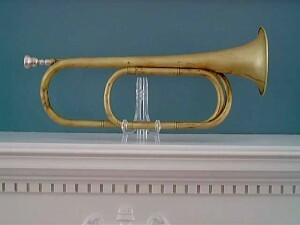 This basic horn came into being as the standard U.S. Army Cavalry trumpet in G, specification No. 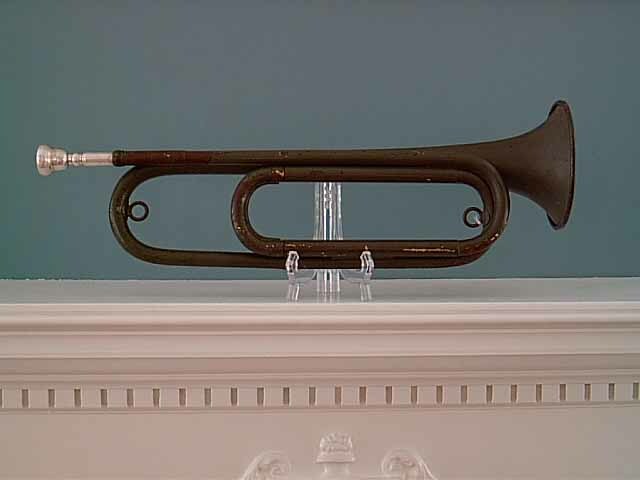 325 dated May 2, 1892 (Quartermaster General’s Office, War Department) which supplanted the previous model 1879 F trumpet with C crook. These were characterized by detailed specifications with drawings and dimensions. 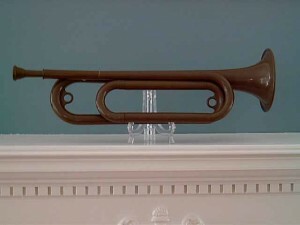 The bugle described in the specifications was to be the basis for almost every bugle manufactured in the U.S. up to the present. These are the specifications outlining the design of the M1892. 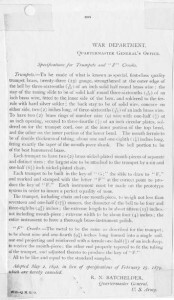 Note that the specifications call for a crook to lower the pitch of the instrument to F.
Natural trumpets with tuning slides came into use in Europe over 200 years ago and a small European trumpet with tuning slide known as an Inventions-horn (trumpet) dates from around 1840. 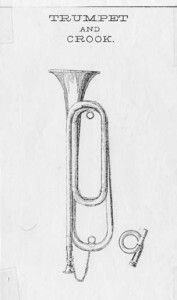 This Inventions-horn resembles the U.S. mounted Infantry trumpet insignia from the pre-Civil War (below) U.S. Army and also the similar army trumpets such as those made by Klemm & Bro. in use before and during the Civil War. The instrument in greatest use during the Civil War was the large belled bugle (clairon) imported from Europe. These bugles or clairons were in the key of C or B flat (with the aid of a crook) and were imported in large quantities during the 1860s. The “regulation” Civil War bugle was a single twist (copper, with a brass garland and a brass reinforcing band 8 inches up), which we see made or imported under contract, and stamped, by Stratton & Foote, Horstmann, Klemm Bros., Draper Bros., Church, and others. Trumpets made in the 1870s and 1880s. The Navy/Marine Corps F trumpets mentioned above play with a lovely mellow tone less bright than the sound of the G trumpet or model 1879 F trumpet. Among other possible sources for design of the model 1892 are the J. Howard Foote Company, J.W. Pepper, and J.W. York (manufacturers) and Horstmann and Lyon & Healy (contractors). The model 1892 trumpet has been modified by various changes over the years to streamline its appearance and make it easier to manufacture. 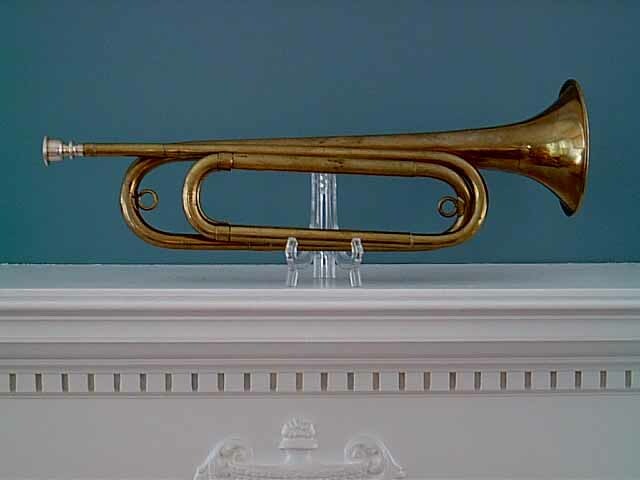 Over the 110-year history of this design there have been at least seventy manufacturers world-wide making these 1892 horns with playing qualities ranging from superb to gosh-awful, but three are especially worthy of mention in this short essay. 1. The Vincent Bach Company, for the superb quality of their G and B flat field trumpets which play wonderfully. 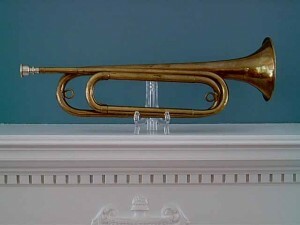 The bugle used by the United States Army Band (Pershing’s Own) is in the key of B flat and was designed after the M1892. 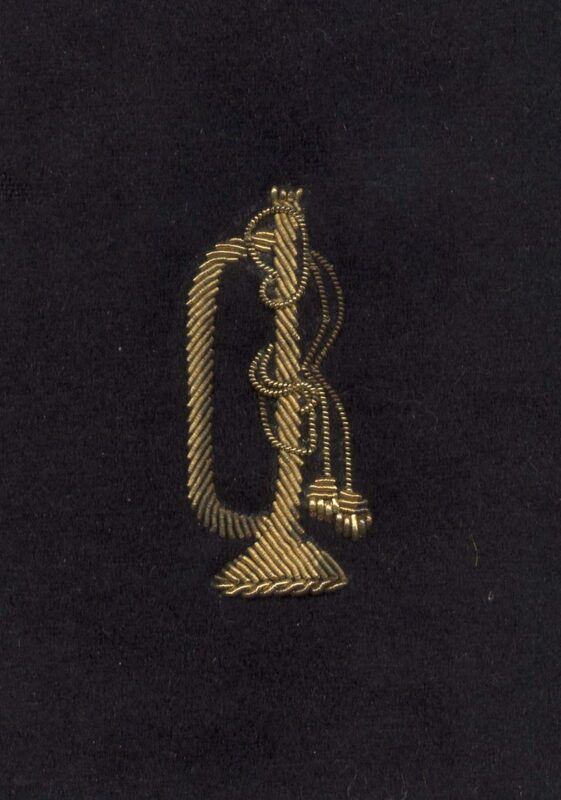 The Army Band decided on this key to match the sound of B flat trumpets, which are used at ceremonies in Arlington National Cemetery when a bugle is not available. Also the thought may have been that the higher pitched sound would carry farther. 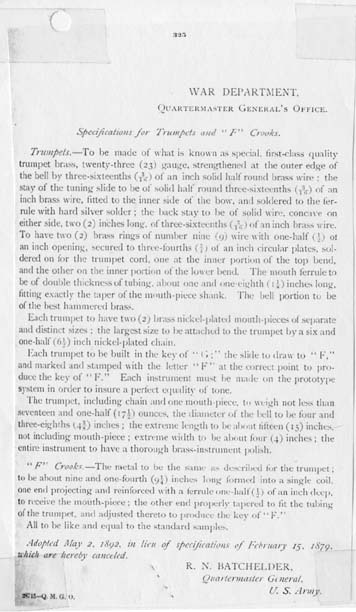 Incidentally, the instrument is called a “Signal Trumpet in B flat,” not a “Field Trumpet” as described in the 1892 specifications. 2. The C.G. Conn Ltd. Company, for overall quality, durability and various design improvements. This company, in existence since 1879, has been a pre-eminent manufacturer of brass instruments. 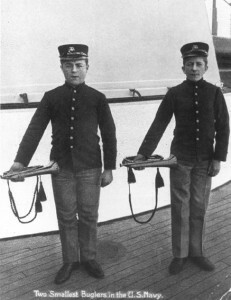 Other M1892 pattern bugle manufacturers include Buescher, York, Holton, Ludwig, Millard, and Weymann. 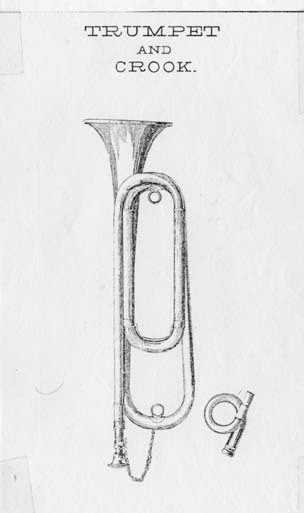 The Boy Scouts of America adopted this basic 1892 design, the many drum and bugle corps founded after World War I standardized on this horn, and due to contest requirements, the horns came to be specified as “U.S. 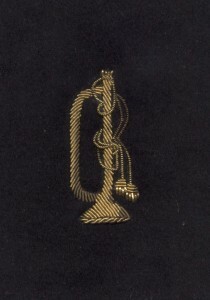 Regulation.” The BSA bugles made by Conn use a cornet mouthpiece instead of a trumpet mouthpiece. The Boy Scouts adopted the M1892 bugle as early as 1916 and the bugle would remain an important part of scouting until interest began to diminish in the 1970s and 80s. 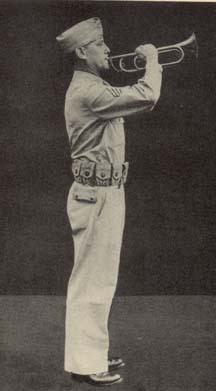 In 1986 the Boy Scouts discontinued their authorization of an “Official Bugle,” although scouts still use bugles or trumpets for ceremonies, troops have troop buglers and it is possible to earn a merit badge for bugling. Eventually all branches of the Army adopted the basic 1892 G trumpet and around 1917 it was adopted by the Navy and Marines. Regular Army, Navy or Marine Corps issue horns never say U.S. Regulation, which is a civilian designation. 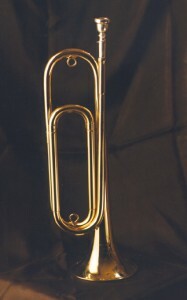 Genuine issue horns are usually marked U.S. or U.S.Q.M.C. or U.S.N. or U.S.M.C. or various depot contract markings. Some have no marks or just the manufacturer’s name. During World War II, these bugles were painted in Olive Drab (O.D.) color. The Olive Drab finish was specified on B flat bugles on Nov. 11, 1932 and it is believed that same date applies to the G trumpets. World War II Olive Drab M1892 horns were made by Conn, Buglecraft, LaRosa and others. During World War I the J.W. 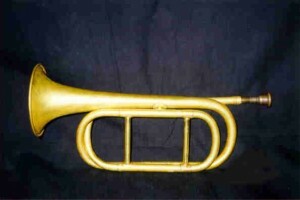 York Co. made a variation of the 1892 horn in F with no slide, and some other makers made them in F or converted them. C.G. Conn, H.N. 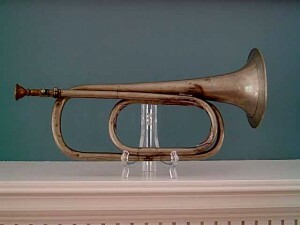 White/King and Wurlitzer made a variation in B flat during the 1930’s, long before the Vincent Bach Model 1955 B flat Signal Trumpet as used in state ceremonies by the U.S. Army Band. 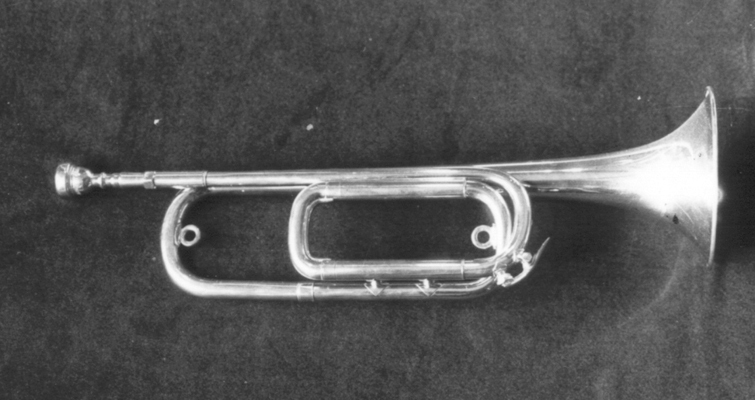 Another variation in the key of A, made by the Kaemph Co., had a single forward circular loop in lieu of a tuning slide but otherwise resembled the standard G trumpet. 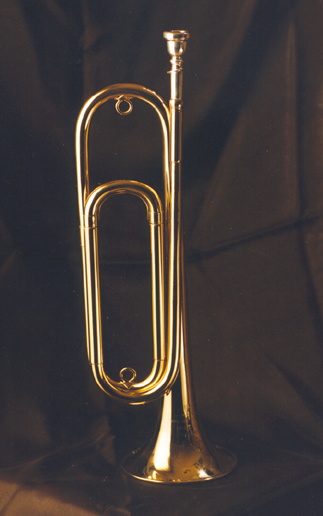 Some service buglers would take a standard G trumpet and cut down the slide to make it into an A or A flat horn. This has been confirmed by at least one Army bugler who had examples of bugles he had converted. There is some small evidence, though not confirmed, that Navy buglers may also have cut down their horns to A. During World War II, when there was a shortage of brass, a plastic bugle was put into service. This variation of the M1892 horn (stock #36-T-648 from the USQM No.6 Army Service Forces Catalog, QM Supply catalog… HQ Army Service Forces 31 Jan. 1944) was made of Tenite developed by the Kodak Corporation and manufactured by the Frank Aman Company. There were two slightly different moldings, the light Olive Drab horns being used by the Army and the darker OD horns with a slight mold difference being used by the Marine Corps during the 1950’s and earlier. This early plastic has a tendency to bleed a milky white coating which is the plasticizers coming to the surface, and over time (many years) the plastic will entirely deteriorate. These horns were issued with a plastic mouthpiece but often a metal one was substituted. There are silver-coated ones to be found also but rarely. 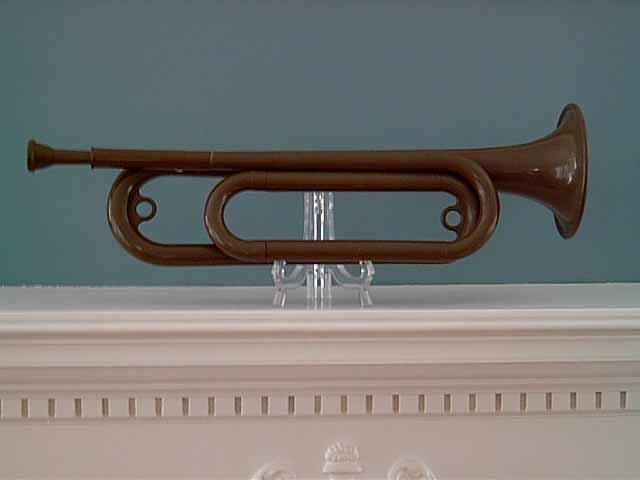 This Tenite (plastic) bugle was designed by Frank Aman who also manufactured the plastic “Tonette” recorder used in elementary schools. These bugles were made by the thousands and many wound up in army surplus stores in the 1950s-70s. 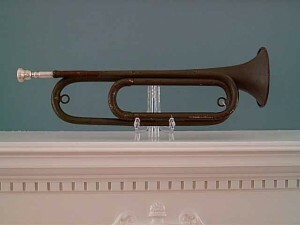 One museum example exists of a convertible model 1892 G trumpet which could be changed into a three-valve trumpet by removing the tuning slide and inserting a complete new valve and tubing section. 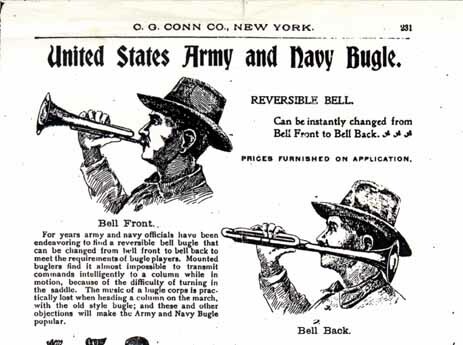 The Conn Company even experimented with a reversible bell in order to have an over the shoulder bugle. 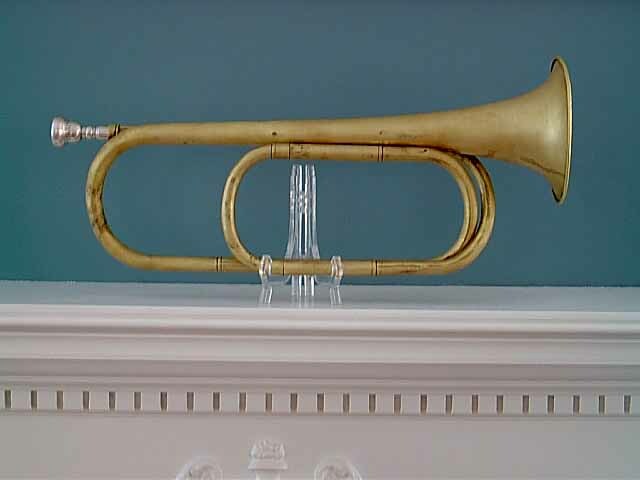 In summary, the 1892 field trumpet in G was a very successful design and it is still in production today although no longer for the U.S. military. The model 1892 specifications were revised in 1918 and 1938, and other regulations were also issued pertaining to their manufacture. many service manuals and period photographs. Jack Carter is a retired electrical engineer and a Marine Corps veteran with a lifelong interest in field music and military music. He plays Highland bagpipes, B flat fife, bugles, field trumpets, Civil War flugelhorns and cornets. He has been in the Civil War reenacting hobby since 1991 as a fifer and bugler. He has collected and studied bugles and trumpets since 1974, served several years on the advisory board of the Streitwieser Trumpet & Horn Museum and was a charter member of the Historic Brass Society.Â At present he is a member of the Company of Fifers & Drummers. © Copyright assigned to Randy Rach, Hartford, MI. All rights reserved. 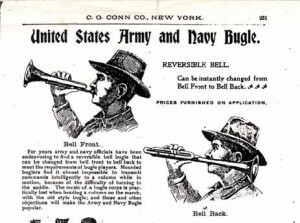 This entry was posted on Saturday, April 13th, 2019 at 3:00 pm	and is filed under Bugle Stories, General Interest, Getting Started on the Bugle, History of the Bugle. You can follow any responses to this entry through the RSS 2.0 feed. Responses are currently closed, but you can trackback from your own site.